It’s been a bit quiet on the blogging front recently, although not in the KfP household as No 1 daughter has been preparing to get married. 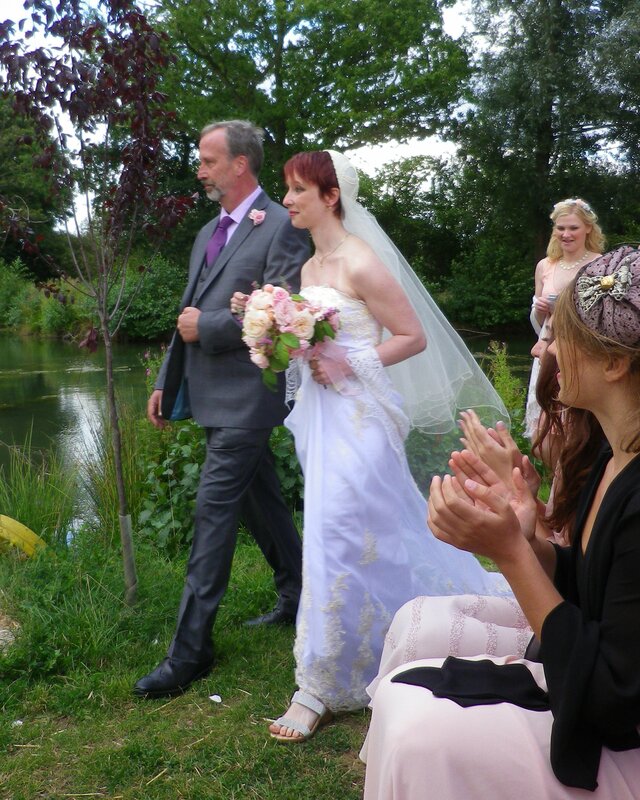 The big day was Saturday – in a field in Essex – and she looked beautiful. 3) garters – how can you forget the “blue” (to go with the old, new and borrowed) until 48 hours before the big day??? OK, the shawl. She wanted something to throw around her shoulders in case it got cold, (it’s a field in Essex, kid, They don’t come with central heating.) No 1 was born on 21 December 1988. She was my winter baby and the pattern for the shawl is called Snow Angel. It is knitted in lace weight wool – I went for Rowan alpaca / merino in pure white – and has loads of little beads added into the knitting. Fortunately the pattern only requires them to be flipped onto the stitch with a crochet hook as there were about 600 beads used in total and I would have become seriously bored trying to string them onto the wool prior to knitting. 2) finding enough space to block it out after I finished it – how do my children manage to acquire so much rubbish and why do they have to spread it around my house? WHAT EVER POSSESSED ME TO AGREE TO SPENDING THE NIGHT IN A TENT?